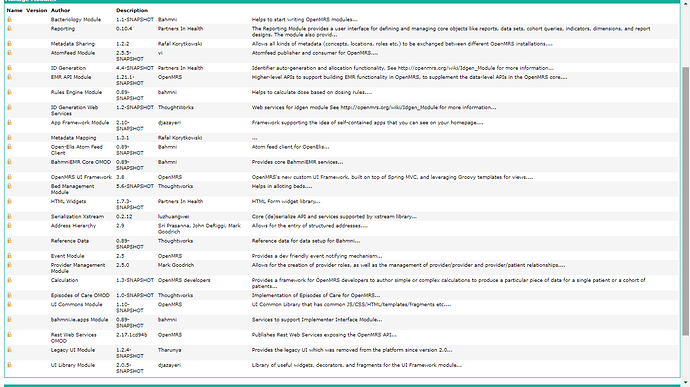 Check OpenMRS logs Check if there are any exceptions in openmrs logs regarding atomfeed. Check failed_events table Check the failed_events table for any entries recorded. according to openmrs log regarding atomfeed. INFO: Creation of SecureRandom instance for session ID generation using [SHA1PRNG] took [2,129] milliseconds. 2017-06-09 18:34:52,132 WARN  [ELIS][NewPooledConnection] [c3p0] A PooledConnection that has already signalled a Connection error is still in use! 2017-06-09 18:34:52,133 WARN  [ELIS][NewPooledConnection] [c3p0] Another error has occurred [ org.postgresql.util.PSQLException: This connection has been closed. ] which will not be reported to listeners! 2017-06-09 18:34:52,133 WARN  [ELIS][NewPooledConnection] [c3p0] A PooledConnection that has already signalled a Connection error is still in use! can you please look at the log file regarding bahmni-lab sync issue ? appreciate you !! any help in this ticket ? Can you go to /openmrs -> Administration -> Modules and see if all the modules are loaded fine? Hi @andrewbhandari, Can you try restarting the services. yes i did restart, even i reboot system, it does not work anymore. is there any other way to get around? finally i could figure out, the problem is database is not define on /etc/bahmni-installer/local after making changes it is okay. bahmni-lab not start after install bahmni!!! What did you change exactly in the local file? I have the same error but all database sections seem to be there. Did you define something extra? kindly help me. I’m facing the same problem, what did you di with the local inventory file? hi @asaidi are you still facing this issue ?